STRATFORD, Ont. – A full moon will shine over Stratford for ten days in a row this summer, when the world-renowned Museum of the Moon touring artwork makes its first-ever appearance in Ontario. 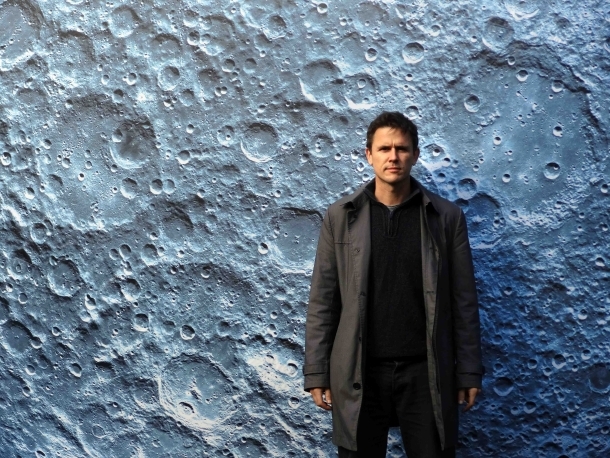 Created by UK artist Luke Jerram (shown in photo), the strikingly realistic, scale-model moon exhibit has been visiting major cultural cities around the world since 2016, inspiring and entertaining wonderstruck audiences with a unique blend of science and art. Stratford Summer Music is bringing The Museum of the Moon to Stratford for its Ontario première from August 16-25, 2018 as part of its annual multi-week music festival that presents more than 100 events featuring more than 350 artists. The elaborate inflatable sphere will float above Tom Patterson Island, a scenic public park in Lake Victoria, close to downtown Stratford. Stratford Summer Music is organizing an extensive program of musical performances and activities to coincide with The Museum of the Moon. Much of the musical programming will have an international flavour to reflect the moon’s influence on all of us around the globe. The festival is also working with a variety of community partners to develop entertaining moon-themed activities. The centrepiece of The Museum of the Moon is a seven-metre diameter moon sculpture — a custom-built balloon illuminated from the inside and covered in highly detailed NASA imagery showing the lunar surface. Built to scale, each centimetre of the artwork represents five kilometres of the moon’s surface. The installation is a fusion of lunar imagery, moonlight and a soundscape created by BAFTA and Ivor Novello award-winning composer Dan Jones. Where has this Moon been this year alone? The Commonwealth Games in Australia; ZAT Urban Spectacles Festival in Montpellier, France; Tall Ships Regatta in Liverpool; and the Kimmel Centre in Philadelphia. “Museum of the Moon allows us to observe and contemplate cultural similarities and differences around the world, and consider the latest moon science. Depending on where the artwork is presented, its meaning and interpretation will shift,” says its creator, Luke Jerram. Further details about a full slate of The Museum of the Moon events will be posted on Stratford Summer Music’s website, stratfordsummermusic.ca, after they are finalized. All The Museum of the Moon activities will be free to the public or pay what you can. The Museum of the Moon will be Stratford Summer Music’s third time hosting art projects created by Jerram. The festival previously installed pianos painted by local artists across downtown Stratford for anyone to play as part of Jerram’s Play Me, I’m Yours art installation. The festival also hosted Jerram’s Sky Orchestra, featuring hot air balloons that drifted above the city playing music for the people below. Stratford Summer Music’s 2018 Season Sponsor is Bard’s on Market Square. The Museum of the Moon exhibit is supported by: Bell, CTV, Flavelle Family Foundation, Magest Building Systems LTD, Margaret D. King, Government of Ontario, Ridgewood Capital Asset Management, City of Stratford and Stratford Public Library. Stratford Summer Music is an annual multi-week music festival in indoor and outdoor venues throughout downtown Stratford. With an artistic vision to produce, to the highest standards possible, a program of diverse and exciting musical performances by Canadian and international artists and to provide the widest possible range of musical genres on its stages, Stratford Summer Music offers audiences a standard of musical excellence and experiences difficult to find outside large urban centres. In 2017, more than 50,000 people enjoyed the music festival’s ticketed or free concerts and events.